On March 8, International Women’s Day, 28 members of the world champion United States women’s soccer team filed a gender discrimination lawsuit regarding the lack of pay equity and working conditions. According to the lawsuit, discrimination against the women athletes not only leaves them with much less than pay than men in the soccer field but also restricts their place of play, training, medical treatment, coaching, and even travel accommodations. The women, stars for over a decade, head to France this summer to defend the Women’s World Cup that they won almost four years ago. Since their third win of the contest in summer of 2015, they have made some gain—doubled prize money pool for the upcoming tournament, the disappearance of artificial turf, and even a chartered flight. Female soccer teams in other countries such as Spain, Brazil, Argentina, Colombia, and Norway have made a few gains since protests by the U.S. women’s team. FIFA, pro soccer teams’ employer, still favor the men by give a pool of $400 million to 32 men’s teams compared to $30 million for 24 women’s teams. According to pay schedules for players participating in 20 games a year, men get an average of $263,320 while women get a maximum of $99,000. That’s after the $17 million more in profit for 2016 that women made over the men. Although the male team lost the 2014 World Cup in Round 16, their bonuses were $5.375; after winning the Cup in 2015, women received $1.725 for bonuses. Women suffer far worse inequities around the world than lack of pay. Poverty, lack of justice and rights, abuse, poorer health, discrimination in education—all these are just a few of the ways that women are wanting in gender equality. But sports is one area that symbolizes the subjection of women to male values. A recent example occurred in a cycling race in Switzerland. In the annual Omloop Het Nieuwsblad, men started two minutes before women—because women are faster. No matter—Nicole Hanselmann took a big lead over the men’s field, that is, before she was told to sit by the side of the road to “neutralise the women’s race in order to restore the gap between” the men and women’s groups. Maybe the men should have had a five-minute head start so that they could win. Women ride the Tour de France through traffic and without media on the day before men get the attention, and the women’s Olympic race is half the length of the men’s race. Olympic cycling events for women didn’t exist until 1984, the same year that events included a women’s marathon but almost a century after the modern Olympic revivals in 1896 included these events for men. Bobbi Gibbs entered the Boston Marathon in 1966 without an application after being told that was told that “women are not physiologically able to run a marathon.” She beat over half the field in 3 hours, 21 minutes. The next year, Kathrine Switzer entered the marathon under her initials and beat her boyfriend. Her time of 4 hours, 20 minutes might have been better if the race co-director had not physically attacked her during the race. Not until 1972 did the AAU allow women to run more than a mile and a half. Other sports still have the gender restrictions: women play two out of three sets in tennis, but men play three out of five. Men said that the rules are meant to protect women’s “reproductive organs” from undue endurance. In the beginning, women’s cycling threatened men because women gained independence with their own transportation. The lack of chaperones caused people to refer to bicycles as “prostitution on wheels.” The reason for gender inequality is to show women that we are inferior. In the U.S., 40 percent of sportspeople are women, but only six to eight percent of the total sports media coverage is devoted to them. Women-only sports stories comprise just 3.5 percent of all sports stories in the four major US newspapers. Each year, male athletes get $179 million more in athletic scholarships—50 percent more—than female athletes receive. Colleges and universities spend only 24 percent of their athletic operating budgets on female sports and just 16 percent of recruiting budgets for women. Coaches for college women’s team sports earn 63 cents for every dollar earned by head coaches of men’s teams. The 2015 Women’s World Cup soccer final was the most watched soccer match—male or female—but its players were far less compensated than male soccer players. In professional soccer, the National Women’s Soccer League has a pay ceiling per player of just $37,800 compared to an average of more than $300,000 and a median of about $100,000 for men’s Major League Soccer. Each team in the NWSL has a salary cap of just $265,000—compared to more than $3 million for men. Of total commercial investment, 0.4 percent goes into women’s sport. People who discriminate against women in sports claim that they won’t receive any attention, that the public wants to watch only men play. This attitude, however, comes from the top. Dictator Donald Trump (DDT) makes news with male championship sports teams, either being rebuffed by them or feeding them fast foods like hamburgers and pizza. Yet he has not invited one female championship team to the White House to honor them on a solo visit—not the 2018 women’s NCAA basketball champions Notre Dame, not the 2017 WNBA champion Minnesota Lynx, nor the 2018 WNBA champion Seattle Storm. The latest invitation, however, was a men’s lower-division NCAA football championship team, the first one invited since Bill Clinton’s time. 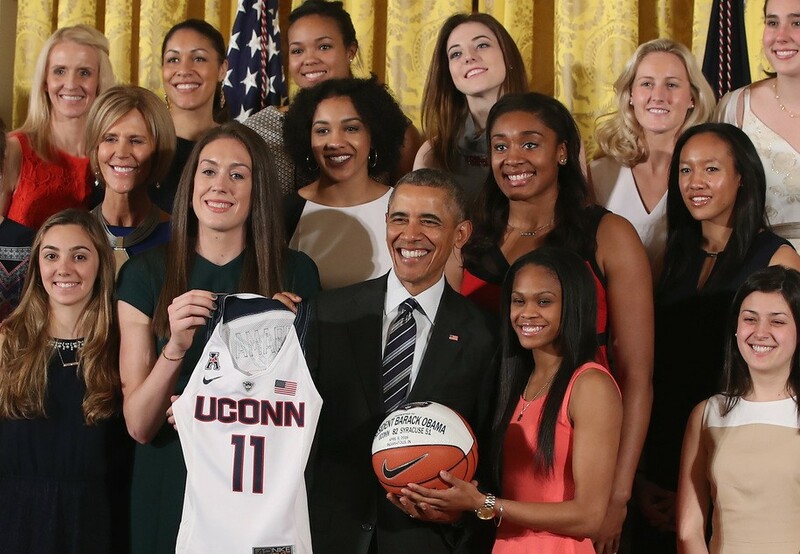 Every other president going back to Ronald Reagan invited the women’s NCAA basketball champions. Here’s President Obama with the 2016 NCAA winners. Politics this year has brought out the worst—thus far—in conservative misogyny. From the minute that Alexandria Ocasio-Cortez was elected a Democratic U.S. representative from New York, journalists stalked her, intent on photographing her from behind, questioning how much she pays for her clothes, why she took an Uber instead of the subway. A Texas city council member called her a “bimbo,” and one of her congressional colleagues yelled “Go back to Puerto Rico!” Conservative pundits call her a “little girl” and fantasize about dating her. On The View, Meghan McCain said she was “really surprised” that Ocasio-Cortez had asked an intelligent question at Michael Cohen’s House hearing. Sen. Bernie Sanders (I-VT) has the same political views, but it’s the conservatives who cried at CPAC that Ocasio-Cortez wants to “take your hamburgers” and replaced incessant smears of Hillary Clinton to those directed at Ocasio-Cortez. The hatred and sexism directed toward Ocasio-Cortez moved to Rep. Ilhan Omar (D-MN) after she criticized the control of Israel over U.S. policy. For decades, GOP congressional members and conservative media protected rampant racism from colleagues and now fail to call out their racist president while becoming livid about Omar’s suggestion that candidates receive millions of dollars to oppose Palestine and support Israel. The attacks didn’t start with her supposed anti-Semitic remarks used to revile her; threats against her began before she was sworn into the 116th Congress also because of her Islam religion. Every word she uses, even “hypnotize,” is classified as an “anti-Semitic trope” while DDT and other white male GOP congressional members escape any criticism. Yet 23 of them voted against all expressions of prejudice such as racism, Islamophobia, and anti-LGBTQ rights except for anti-Semitism. Omar is even being blamed for the spike in anti-Jewish hate crimes that began with DDT’s election. Sen. Bernie Sanders, who is Jewish, said that while anti-Semitism is a “hateful and dangerous ideology,” it must not be confused with criticism of Israel’s government under the right-wing leadership of Benjamin Netanyahu. Sens. Elizabeth Warren (D-MA) and Kamala Harris (D-CA) joined Sanders in defending Omar because they, too, have suffered from the misogyny, especially since the women declared their candidacies for the 2020 presidential election. After condemning Hillary Clinton for being too “icy,” pundits slam Warren for being “aloof” and Harris for connecting with audiences “too much.” For weeks, opinionists agonized over whether the women presidential candidates were “authentic” and found stories to show that they are phonies. Warren’s oral history of Native American background from the 1980s appears again and again—and again. (The same people overlook DDT’s 9,000 lies.) Sen. Kirsten Gillibrand (D-NY) was attacked for talking about how to eat fried chicken, and Sen. Amy Klobuchar is “mean.” Authenticity for women is being a secretary or staff member. The theme for the 2019 International Women’s Day is “Think Equal, Build Smart, Innovate for Change.” Almost half the Democrats running for president in 2020 are women, and a pro sports team is suing for equality. Ocasio-Cortez and Omar are making changes in Congress along with the other 108 Democratic women plus their allies. These changes plus millions of others may bring women into the 21st century.